I had to do something similar for a set of Google calendars recently and did it through the GUI (Calendar settings > Customize the color, size, and other options > Calendars to Display). The resulting embed code is the same as shown in your post, but might be a bit easier to produce. 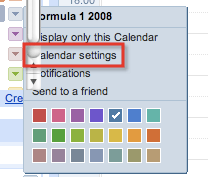 Users get the option to show/hide each calendar in the aggregated, embedded view. I have to thank your network, I had no idea, and now I know. I feel stupid, but I also feel rich as kings. So thank you much. And while I see the option in Google Calendars now, the question of aggregation ical from a series of different calendars remains the next step in my mind. Need we ask everyone to use Google? Etc. I’ll do a quick post on this later today. After stripping the iFrame out, I found that I had to convert all the “&” to “&” in order to use the Google generated code as a stand alone link. Otherwise it would produce a blank calendar. ahhhh, this keeps stripping things out of my comments! remove all the “amp;” from after the “&” sign, and everything works as a link. Brandt – your tip was just what I needed as I couldn’t figure out how to turn the iframe code into a stand alone link. Great Work! This appears to have broken with the 7/29/09 google apps release… are you seeing an error now? Thanks for this critical info. We have been using HTML Calendaring for our site and I have wanted this functionality out of Google Calendar. I greatly appreciate it! Brandt – you are my hero – that is exactly what I was looking for. I am using embedded calendars showing multiple calendars but some mobile browsers don’t support the iframe, so they were locked out of the calendar. Now with what you mentioned about swapping out the ampersand codes with real ampersands, which creates a standalone link, I can check for mobile browsers and deliver the stand alone link to them. 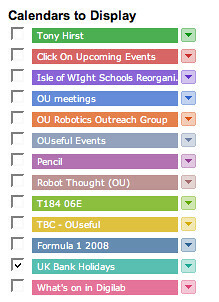 Very neat feature that allows me to seperate my personal and work calenders for sharing and yet see them all in one place. 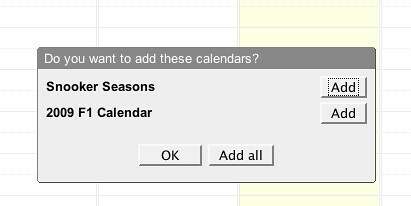 What if I want all my calendars together in one google sites calendar, but have the option of only seeing some of them. For example, in my Cub Scout pack, a parent might want to see information about the pack and his den, but not other dens. 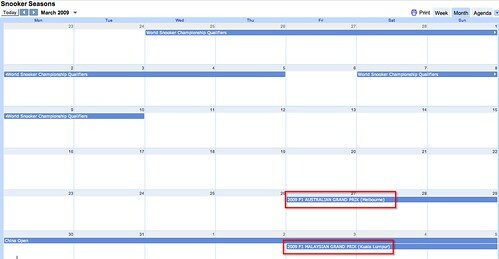 @deborah in Google calendar, you can choose which calendars you want to display if they have separate calendar feeds. Tony, thanks for the tips. So I’m able to embed a calendar with multiple calendars into on single calendar view. 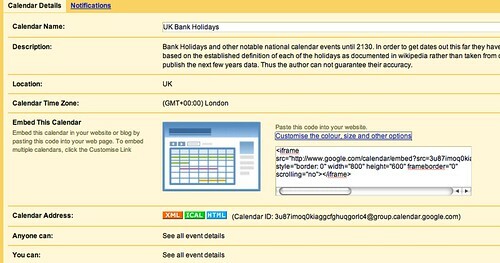 Is there a way to then generate an XML link for the new aggregated calendar calendar? I know this is a year old, but if you happened to find a solution I’d love to know. Too bad it is limited to 25 calendars to embed in the HTML code today. I would need about 40 (for an dance school, 40 different types of lessons). If anyone should know a way how to make such an embedded calendar view with more than 25 individual calendars, please share. Anyone know a way to do this in a widget? FotoDirk: I also ran into this limitation as I have upwards of 40 calendars. The question is, do those all have to be publically viewable in an aggregated way, or can you put up groups of lessons? Also, if you get that actual students to register on google and then import all the calendars, they will be able to see them all through the Google calendar view. Hi Billy – Great stuff:-) I think the Google Calendar API has moved on somewhat since I wrote this post: I’ll try to go through the comments over the next week or two to distill the various workarounds and add any updates into the original post. This is a great link, thanks! This could be used to schedule meetings by showing someone your availability by embedding the calendar on a Google Sites page, if you have your calendar set to public.